Finnish netminder Miika Wiikman was only 14 when Paul Adey, Jamie Leach and Ashley Tait were the heroes at the old Nottingham Ice Stadium in the late 1990s. But Wiikman, who helped the current Panthers squad to the top of the Elite League table last weekend, had some other Nottingham heroes to look up to nearly 20 years ago. The 31-year-old, who has played in some of the top leagues in Europe and also the highly-rated American Hockey League, has already won the hearts of the club's supporters and his name often rings out around the National Ice Centre. And he seems to have quickly fallen in love with the club and the city, although his first Nottingham love was for football club Forest. "When I was a kid, my dad was a Newcastle fan and he tried to get me to root for Newcastle," Wiikman told BBC Radio Nottingham. "My uncle stepped in and told me to root for Forest and I said 'all right, let's go for Forest'. I have been rooting for the team ever since. "The players I remember most are Steve Stone, Stuart Pearce and Pierre van Hooijdonk." Wiikman had big skates to fill when he arrived in Nottingham to replace Craig Kowalski, probably the Panthers' most popular netminder ever. The pair were on opposite sides last month when Kowalski returned to play in coach Corey Neilson's testimonial game. So did the lure of Nottingham Forest have anything to do with Wiikman signing for the Panthers in the summer? "It was just a coincidence," said Wiikman. "But when I heard about interest from Nottingham, I thought 'wow, that would be great' and then it happened." As well as enjoying his time on the ice, Wiikman is already settled away from his chosen sport and managed to see his heroes win their biggest game of the season so far, as Forest beat Derby County 1-0 at the City Ground on 6 November. "I went down to see the Derby game, which was a great game obviously as they won," he said. "It was a great atmosphere and it was just great to go and see them live for the first time. I have seen them on TV before but never live, so it was a great experience for me and my family." On the ice, Wiikman collected his first shutout of the season at the weekend as Panthers beat Coventry Blaze 4-0 at the NIC and Nottingham went top of the table with Sunday's 4-1 win at Sheffield Steelers. He is currently leading the league's netminder statistics, conceding only 1.95 goals per game on average and with a save percentage of 93.1%. Panthers have lost once in regulation time in the league this season and are on a run of five successive victories, but Wiikman is warning against complacency. 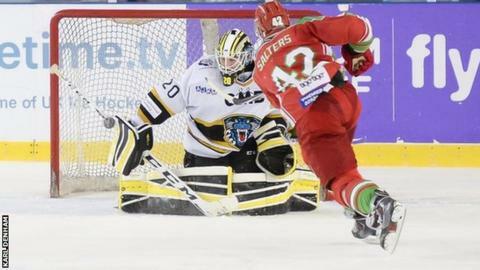 "There are a lot of good teams in the league this year - Cardiff, Sheffield, Braehead," he added. "Edinburgh are doing good too and then there's Belfast. "It is going to be a really tight race this year, so every game is so big and so important."